Quinnipiac soccer star Rashawn Dally is living the dream his father sacrificed for his family long ago. Jamaican native Victor Dally was 26 years young when he got the call he dreamed of receiving his entire life. Dally’s skill with a soccer ball had earned him the nickname “Rulla” amongst his peers, because of his ability to “rule the ball” when he roamed the pitch. The Jamaican National team took notice and phoned Dally, offering him a chance to represent his country on the soccer field. Then the phone rang again. The second call provided an opportunity to accomplish a different, more important dream. Dally had been given the chance to come to America and build a higher quality of life for him and his family, which he could not pass up. Instead of playing the game he loved in front of the family and friends who marveled at his soccer abilities, Dally hopped on a plane for Connecticut, alone with his thoughts of the opportunity that had seemingly passed him by. 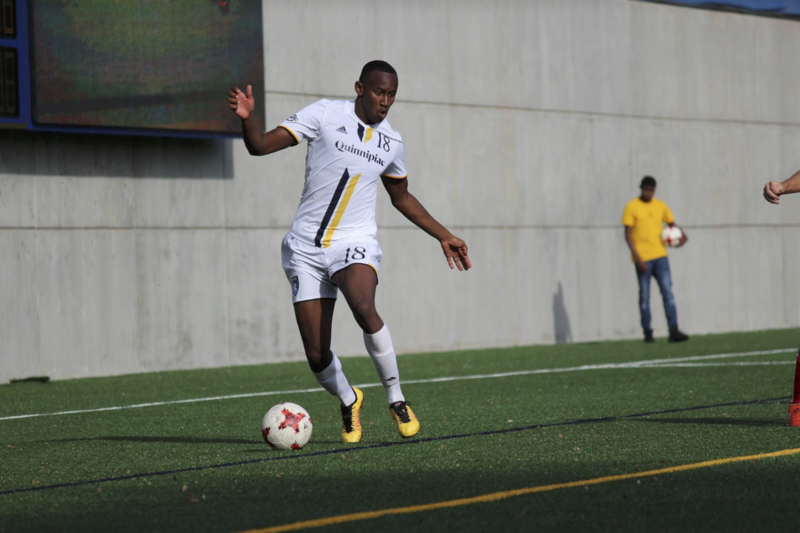 Yet Victor Dally’s dream was reawakened with the birth of his son Rashawn, who helped his father accomplish a goal that was over two decades in the making when he was invited to the Jamaican National Team camp in March. For Rashawn, who knows the sacrifices his father made for his family’s sake, the dream is doubly rewarding. “It’s like I’m living [my father’s] dream at the same time.” he said. Rashawn finds himself following in his father’s footsteps, but it didn’t start out that way. With his father cementing himself in the states, he struggled to awaken the natural gifts that his father had passed down. The history involved juggling soccer balls together in the driveway. At the beginning, Rashawn could manage four or five juggles before the ball fell harmlessly to the ground. Victor offered cash rewards for every juggling milestone that Rashawn could reach. Soon, Rashawn reached $100. Then $200, as Victor’s pockets became dangerously light. “Once he got to $300, I told him I couldn’t pay him anymore,” Victor laughed. The cash prizes disappeared, but Victor remained a fixture in Rashawn’s blossoming career. The two headed to the pitch at 6 a.m. before school to practice, as Rashawn’s teachers pulled up to school to prepare for the opening bell and see him outside. His high school teachers watched Rashawn win Bloomfield High School a state championship in his sophomore season, including a game-winning goal in the state semifinals. Rashawn’s number one fan ran around the field in joy after watching his son catapult Bloomfield into the state finals. “’Another Rulla rises! I can hang my boots up now!” Victor screamed while his son celebrated. Officially armed with the ‘Rulla Jr.’ label, Rashawn took his talents to Quinnipiac, where he has been named to the All-MAAC Second Team two years in a row and named among the top-40 Division-I prospects in New England. As the crowds grow larger and the stakes grow higher, one constant remains: his father is always looking on. Victor’s supportive chants and cheers are also heard from Rashawn’s coaches and teammates. The Bobcats, who break their practice huddles with a chorus of “family,” appreciate the bond that Rashawn and Victor share. Rashawn and Victor were dealt a dose of grief in March when they received a phone call notifying them of the passing of Rashawn’s uncle. The family would have to fly back to Jamaica to attend the funeral. It was a call that brought Victor back to when he was 26 years old, only this time it was an even prouder moment, as his son received an invitation to the Jamaican National Team Camp. The trip was bittersweet, but the team asked if Rashawn could arrive on the same weekend as his uncle’s funeral. After paying their respects, Victor and Rashawn hopped in a car and drove across the country to Kingston. Victor would have never let his son miss the camp. After missing the camp himself over two decades before, he was going to watch his son play with Jamaica’s best. It was a dream come true, only better. Rashawn, who accomplished his dream thanks to a fatherly sacrifice, feels the same way. A dream delayed is not a dream denied. Just ask the Dallys.